I'm not a runner by any means, but I do like catching the NYC Marathon in person to cheer the participants on. It's inspiring to witness the culmination of years of training and motivation. 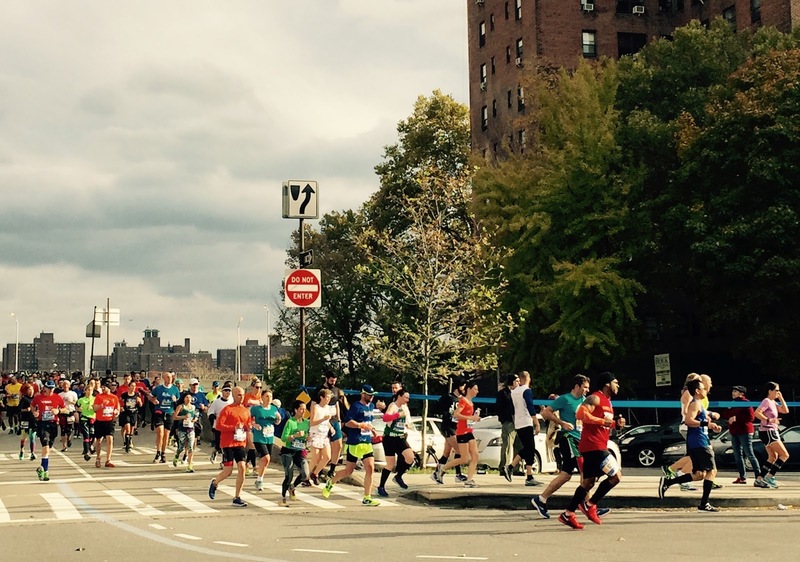 Qualifying for this marathon is feat of its own, but then watching them tackle the race itself is just humbling (FYI, this year's winners blazed through the five boroughs in just two hours!). They worked so hard and here we were celebrating this incredible milestone in their lives. The 26-mile course passes right by my new apartment in Harlem and so yesterday I took some time to join the other spectators and make some noise. My heart kept swelling up as I watched thousands upon thousands cross back into Manhattan for the final stretch down Fifth Avenue towards Central Park. Some were still going strong at the 21-mile mark and others were struggling, cramping up, pushing to keep on and we did the best we could to give them life with our claps and whistles. It almost made you want to run out there with them and feel that exhilaration of being thisclose to accomplishing what I can imagine for most has been a lifelong dream. Now I say I'm not a runner, but the few times I've jogged I've thought, "Man, if I had ever chosen a sport when I was younger no doubt it would have been track and field." Granted, the most I've accomplished is a three-mile run, but I know that if the motivation were in place, I could go for longer. Back in May, I thought that signing up for upcoming races would be just the push I needed to hit the pavement again. Running a 5K was a goal I'd toyed with for a few years, but it hadn't been a big enough one for me to seriously pursue. 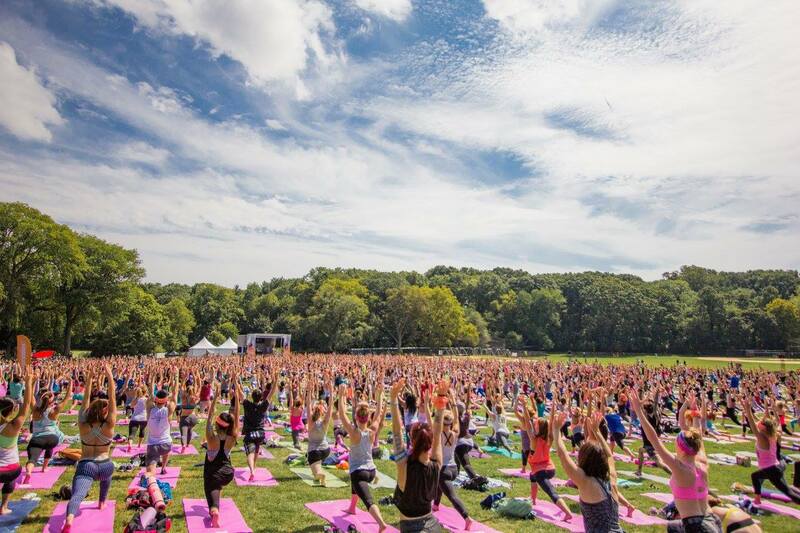 In comes the Wanderlust 108 Festival in Brooklyn, NY and it sounds like a fantastic experience. The September event was pegged as "mindful triathlon" in which participants run a 5k, do yoga in the wide open lawn of Prospect Park, and then meditate under the sun. Okay, somehow four months came and went and did I run a single mile in preparation for this thing? Nope! In fact, had I run a single mile in the last couple of years so that maybe I had a fighting chance of doing well at this thing? Nope again! And still I showed up fully prepared to kill it or have it kill me. I did my little "let me look like I totally know what I'm doing here" stretch and joined the sea of neon sports bras and tights at the start line. I didn't know how well I'd do, but at the very least I had shown up and I was going to give it my best shot. Needless to say I wasn't able to run the entire three miles without stopping a couple times, but I definitely ran a good majority of it and that alone was enough to make me almost shed tears when I high-fived the MC in mid-air at the finish line. I also wanted to shed tears for the week following because I'd shredded my legs in the process, but in that moment I felt so damn elated and hyped that I could have very well kept on running for another mile (and promptly died, but that's neither here nor there). Instead, I grabbed my yoga mat from baggage check and hurried along to grab a spot for the next activities. The guided meditation was alright (I'm partial to the STFU school of meditation), but my reaction to doing yoga took me by surprise. I'm a very sensitive person, I know this, and emotional through and through, but I was still taken off guard by my wanting to cry throughout the whole routine. I kept wondering what the hell was wrong with me, but eventually I just leaned into the sensations; there was no sense in fighting back something that felt that good. My heart kept wanting to explode with each upward facing dog, basking under the warm sun with hundreds upon hundreds of others around me. I was overflowing with gratitude for sharing this incredible moment with all of these beautiful strangers. It's been two months since that joyful experience and yesterday, while I was cheering those amazing souls on towards their finish line, I felt that boundless gratitude once again. Having walked 26 miles non-stop a couple times - I'm just lost in admiration for anyone that can RUN that far! Wow, how long did that walk take?? I haven't clicked on blogs in a very long time but I click on yours tonight and it's about running. Of course. Someone loves and connects us, Dorkys. Hi! It's so nice to see you rummaging through these parts again. You need to hit the trails, woman!